The natural entrance to the caves of Carlsbad. Down, down, down we go into the belly of the cave! 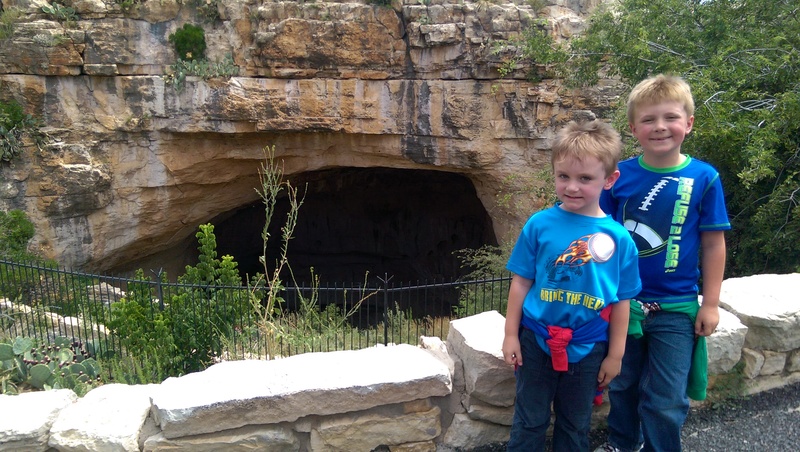 My pride was telling me, “Why not?” We’d see more of the cave, the kids had done a lot of driving the day before and would be doing more driving that day, so some extra exercise would be good right? While all of that was true, I didn’t stop to think about what it is we are actually seeing and how passionate I was about the destination. 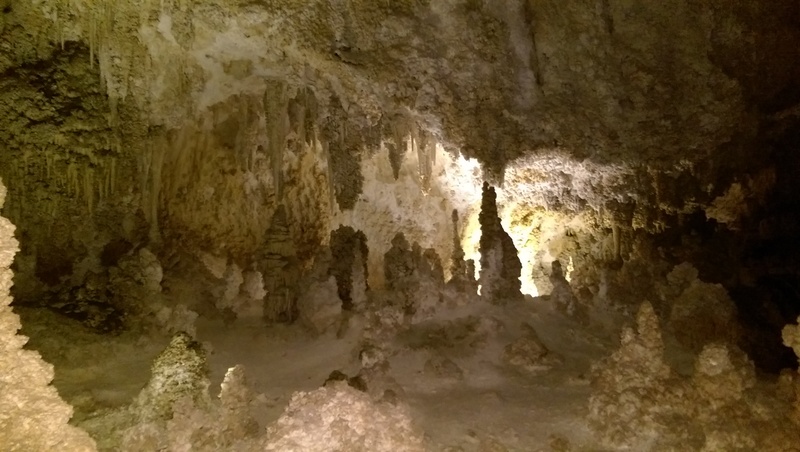 I was excited to see the natural wonder of the cave, and while there were a few unique formations here and there, in general, the cave started to look pretty much like the same thing over and over as time went on. 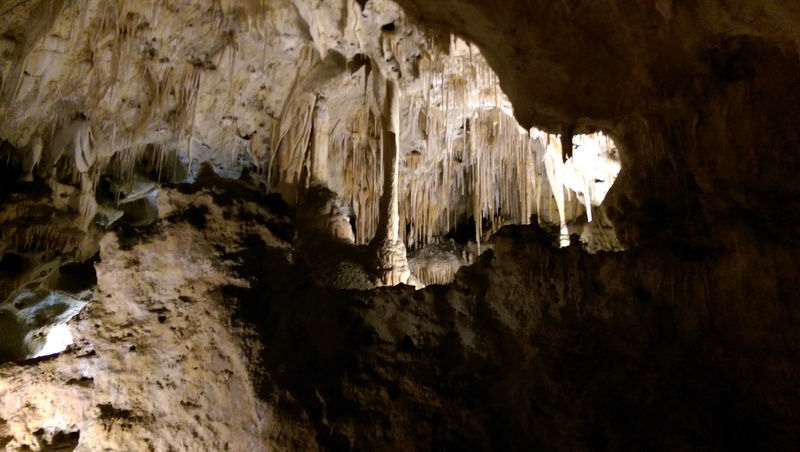 By time we got to the Big Room, which mind you is another mile plus route full circle, I was a little “caved-out.” The Big Room was quite a spectacle, it offered a sample of every type of formation we had seen along the way and was far more fascinating. 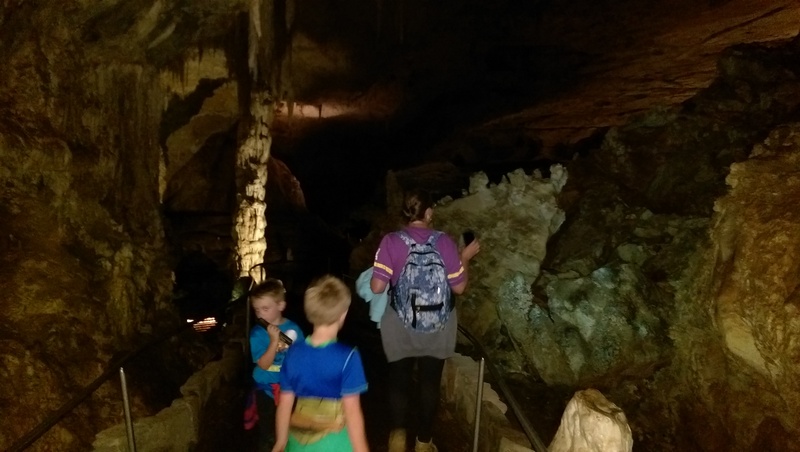 You had all that you could have imagined your trip to the caverns to be in one circular trail that didn’t have a continuous downward slope. Sadly for us, after spending about 90 minutes just getting to the Big Room, the kids were getting hungry and even I was getting a little restless. We should have just taken the elevator down to the Big Room and then explored more closely the numerous wonders it presented. That would have been the practical choice. In the Big Room, shining a little light in the darkness below. I realized that I had approached our choice of whether or not to walk down or take the elevator down more from a matter of pride than practicality. I thought, “Of course my kids could handle it! We’re around the world explorers.” And, “I’m physically fit to handle this, I don’t need to take the easy way in.” All of these thoughts floated through my mind. But what I wasn’t honest about was whether or not I really wanted to see all the cave. How important was it really to me? Was that extra 90 minutes really worth giving up time in the main attraction? Or giving up time in the town we were heading to next? Learning how to weigh priorities on vacation can be a difficult task, especially when you don’t imagine yourself returning to the same destination. There is always more to see than you have time for on a vacation. Sometimes you aren’t given the choice of the short vs. long or the easy vs. hard. But when you are, consider a few of the following questions. On a scale of 1 to 10 (10 being a lifelong dream come true), how excited are you to tour this site? If it isn’t the only thing on your list of things to that day, take the easy/short route if your answer is less than a 7 on the scale of importance. How different is the scenery throughout the attraction from the beginning of the longest route to the end? I.e. will you see basically the same thing if you just take the short cut? Is there a price difference between the two? If so, what is the cost/benefit of the choices? If you don’t see everything this trip, is it worth enough to come back to? Ask yourself “pride or practicality”? We all love a good travel adventure story, but ultimately, our desire should be to enjoy our vacation. If part of your vacation enjoyment is the thrill of pushing yourself to do things you aren’t sure are possible (and I admit that I lean that way when traveling) then great, go for a longer harder option of your trip. But if the accomplishment at the end is not going to be all that thrilling, then error on the side of practicality. Especially with young kids, much of what I do with them now isn’t necessarily so that they can remember, learn and retain everything we do, but more so they get constant exposure to travel as a norm. That makes it much easier and meaningful when they are older to truly experience different environments and not feel uncomfortable or worried about what they might encounter. So looking back on our cave experience, myself and the kids would have gotten the same benefit out of a short elevator ride down into the Big Room, where we saw the same elements, still experienced walking deep underground and would have had more time at our next destination, which was to be sand sledding at the White Sands National Park. Lesson learned!